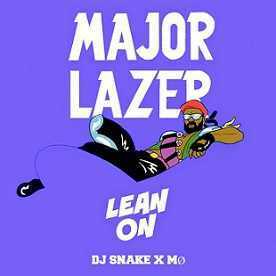 The hit single "Lean On" was produced by Major Lazer and DJ Snake and released as the first single of Major Lazer’s third album, Peace is the Mission, which was released in 2015. The song features the Danish singer MØ, she also wrote the lyrics, along with Major Lazer and DJ Snake.The song was a global hit upon its release. It topped the charts in many countries around the world including Holland, Australia, Mexico and many more. The critically and commercially acclaimed song reached the fourth position in the United States Billboard Hot 100 charts. It stayed in the top ten for ten consecutive weeks. It took less than a month from its release to reach Spotify’s Global Top 10 charts and it has stayed there at or near the top ever since then. It also reached the US Top Ten streaming platform’s chart and stayed there for twenty three consecutive weeks. It also reached second at the UK Singles Chart and stayed in the top ten for twelve weeks.The video of the song was released in March of 2015 and has been viewed over 1.7 billion times on YouTube to this date. The video was shot and recorded in different cities of India and was high in the iTunes ranking of Top Songs downloaded. The song was played hundreds of millions of times on Sound Cloud and was played more than 880 million times on Spotify, which alone earned the song millions of dollars in royalty payments. It is one of the two songs to reach such a high number of streaming on Spotify. It was the 5th bestselling song of 2015 globally. And with worldwide sales in the excess of 13.1 million, it is also one of the bestselling singles of all time. The hit single received mostly positive reviews from critics. Critics praised the Danish singer MO and DJ Snake for their efforts. Rolling Stone magazine picked Lean On as the 48th best song out of 50 for its Top 50 best songs of 2015 list. It was ranked 1st in Billboard’s 2015 list of Top Ten Dance/Electronic songs. It was overtaken on charts and streams by another artist of the same label, Drake. His single One Dance is the only song with more streams on Spotify then "Lean On". The fan-following in India prompted Major Lazer to record the song there. It was recorded at ND Studios and directed by Tim Erem. There are also some shots of Stockholm’s town hall, the Gold Room in it. The dance routine of singer MO and the other artists in the video were a viral hit and prompted many adaptions by people on social media and dancers all around the world.